‘Inside the head of gods’ is an EP of music made to accompany the paintings of Taichi Kondo for his exhibition ‘What’s my name?’ at Finale Art File in Manila, Philippines, April 6 – April 30, 2016.When I first saw his paintings, they gave me a very clear sound of music. I had many ideas, and there were many elements of each of his paintings to represent through music. When I began creating the music, I made many different kinds of tracks with different lengths, structures, timbres, quiet or loud, rhythmic or not, analog or synthetic, field recordings or noise.. but later, while these different pieces did represent the music, it didn’t sound right in a true setting – not with what I imagined the gallery space would represent, and how it would be heard.In the end, I chose to use only the first track I made, which was around 20 minutes of organ music. I listened in different settings, replayed it in different ways, and mixed and remixed it. At first I thought it was too simple and minimal, but when I listened back closely, all of those elements from before were actually there, just in a similar form of each other, rather than separated. Like the paint on a canvas, it’s all made of paint – the colors and shapes are what makes it different. ‘Inside the head of gods’ is intended to be listened to at medium volume, in random playback mode if available. Новый альбом проживающего в Японии музыканта Уилла Лонга состоит из десяти треков и длится всего двадцать четыре минуты, но, если последовать рекомендации автора на обложке и воспользоваться функцией случайного воспроизведения на вашей стереосистеме, то можно слушать его бесконечно долго, раз за разом получая не повторяющийся никогда больше результат. Видимо, в таком виде «Inside The Head Of Gods» и проигрывался почти весь апрель 2016 года в галерее «Finale Art File» в Маниле, где проходила выставка работ художника Таичи Кондо – собственно, для этих целей Уилл и создал эту музыку, разделив изначальный двадцатиминутый трек, созданный им только из звуков органа, и подвергнув получившийся материал различным звуковым обработкам, ремикшированию и прочим хитростям. Получились короткие (зачастую – очень короткие) композиции без имени, обильно восполняющие вашу жажду абстрактного и минималистичного (в этом плане даже в контексте всего творчества «Celer» он является эталоном минимализма) эмбиента, обильно перемежающегося тишиной, которой порой отводится, кажется, гораздо более важная роль, чем непосредственно музыке. По отдельности эти атмосферные, бессюжетные отрезки не представляют особой ценности, но вместе они работают замечательно, создавая тихое, уютное пространство, где разворачиваются (пусть только в воображении) инсталляции эмоций и выставки ментальных картин, нарисованных по мотивах ваших снов. Признаться, я давно не слушал «Celer», примерно около года, и уже успел порядком подзабыть, какими уютными и простыми могут быть созданные Уиллом треки, особенно если слушать их на тихой громкости – они сами сделают все, чтобы завлечь слушателя, «отформатируют» под себя его настроение и помогут погрузиться в мир, сотканный из видений, вырванных из объятий дремы, коллажей повседневных звуков и образов, несуществующей музыки. Here we have a new CD ep/ digital download from respected & highly prolific Us ambient project Celer (aka Will Long). The twenty four minute work takes in a single piece, split into 10 parts. And what have here is slowly revolving, fading, and growing slice of organ based ambient. The music from this release was commissioned for a exhibition of paintings by Japanese-Filipino artist’s Taichi Kondo. The exhibition was entitled “What’s my name”, and it took place in the Philippines during most of April this year. The one-man exhibition explored the idea of dualities as perceived by the senses and as part of imagining a new “provisional world”. Posing the question of identity to both self and the public, Kondo showed how diversity is produced through the merging and meeting of binary or dual forces: heaven and hell, creation and destruction, humanity and divinity, civilization and chaos, for instance. The paintings were rendered in a primitive style, underscoring the raw energy inherent in this process. 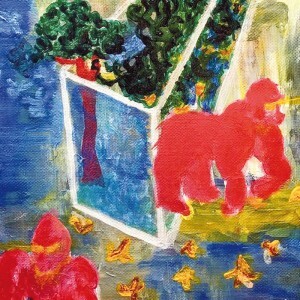 The CD comes in a colour card slip sleeve, and on it’s front is one of Kondo’s primitive & raw paintings- this is a colourfully yet quite surreally busy affair taking in yellow eyed gorillas, woodland contained in a box. A yellow, green, and blue oil paint backing, and a series of uniformed yellow mixed with brown dabs. The track here is based around a slow, drowsy, and fairly simple series of organ notes. These drift & ebb along in a very lulling & dreamy manner, and mark out a rising & dipping melody. Over the pieces length the organ dies back to barely audible, and then back up to simmering & brightly sustained. I guess you’d say this is ambient at it’s most simple, sparse & pared back- it very much feels like the classic & original interpretation of the form, where the sound is purely there to sonically paint a room/space in a highly minimal way. The piece seemingly has no beginning or end, but instead just drift back & forth between simmering rises & different levels of audibility- so as a result you could easily have this set on repeat. I’ll have to admit that my first few plays of this left me a little under whelmed- as it just felt a little too stripped back & simple for its own good. But as I’ve played it a few more times, trying not to concentrate too much on it, and let it become more background sound- I’ve found it a bit more appealing. So in summing up, I can’t say this is one of my favourite release by Celer as there doesn’t seem much depth or longevity, compared with some of his works. But as ambient in the classic form goes this is well realized & skilful made, and if you are looking for more background/ drifting ambience it’s worth a look. Will Long is ridiculously prolific. ‘Inside the Head of Gods’ is no less, his third physical release this year. Past years have yielded similar results. Based on the paintings of Taichi Kondo for his exhibition ‘What’s My Name?’ in the Philippines; Celer has taken inspiration from various elements of the artwork and made an aural accompaniment. The varying imagery giving rise to the sounds, whether they be quiet, loud, synthetic or analogue. This latest piece of work is best played in one sitting. Rich tonal throbs ooze out as long warm drones; remaining as a friendly cascade of musical colour, rarely dipping their toes into darkness. Essentially, the ten relatively short tracks on display do play out as one long track. There is little to be gained by skipping and searching through, for any vast difference between them. If anything, this could quite easily have been on a loop in the background to the installation itself, being as inoffensive and endearing as it is.